So, Wonder Woman. A surprisingly good movie released by Warner in 2017 and of course, Mattel has the license to make toys based on this movie. In the DC Multiverse 6-inch line, Mattel produced four characters for regular distribution, each with a piece to build a larger Ares bonus figure; although there are also a couple of store exclusives that provide some extra accessories specifically for the God of War figure. 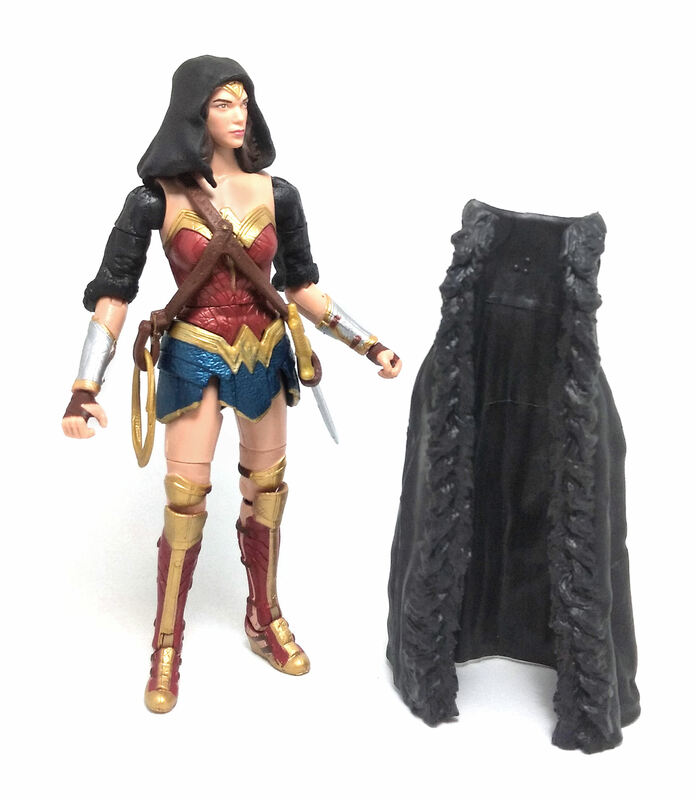 Today we’ll be talking the Wonder Woman with Cloak figure, which depicts Diana wearing the outfit she used when the antique picture from the Batman vs Superman movie was taken. 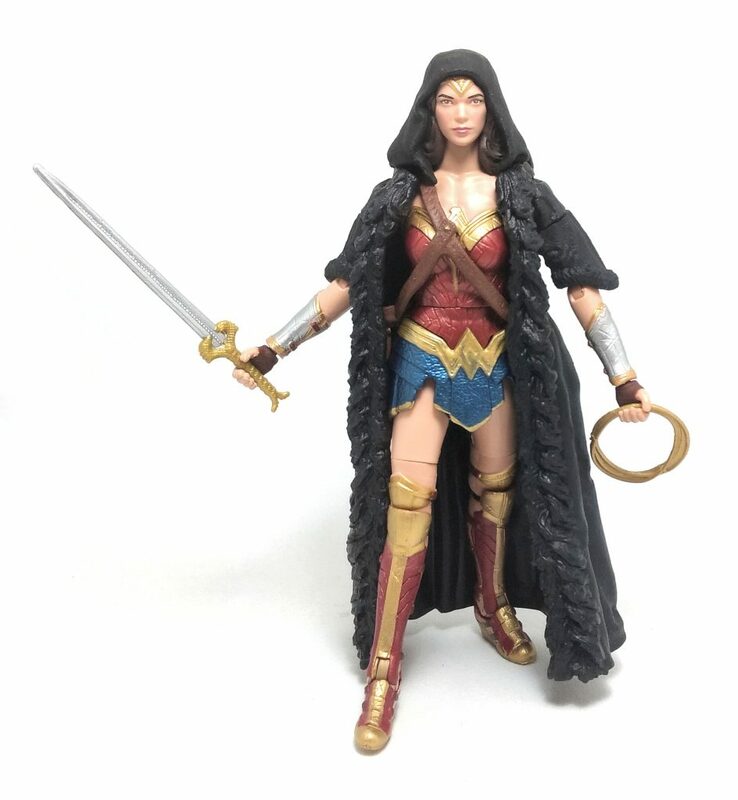 In order to accomplish that, this version of Wonder Woman sports newly sculpted upper arms covered with short sleeves and a new hooded head. The rest if the body is covered with a long, removable vest piece. 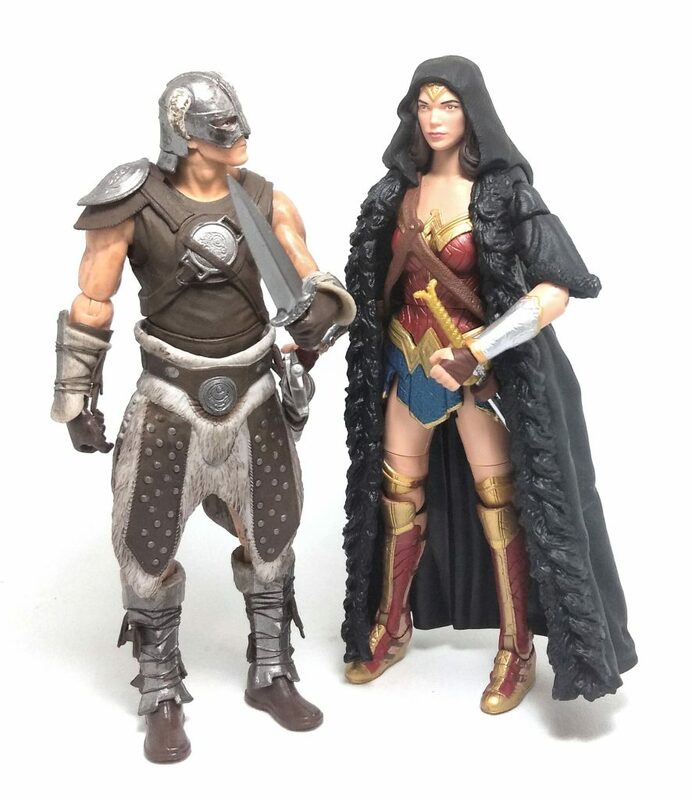 Underneath the vest, we find that Diana wears her movie-designed Wonder Woman garb, which includes a baldric with loops to carry her sword and lasso. The baldric itself is glued to the upper body of the figure, but the loop on her right hip can be opened to put the lasso in. 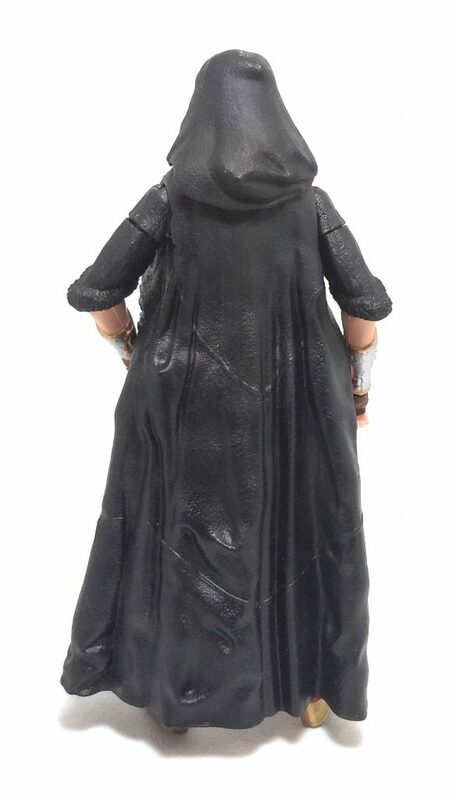 Of course, removing the vest piece leaves us with the hood and sleeves still on the figure, which is not a look you’d want to display but allows us to better appreciate the sculpture underneath. 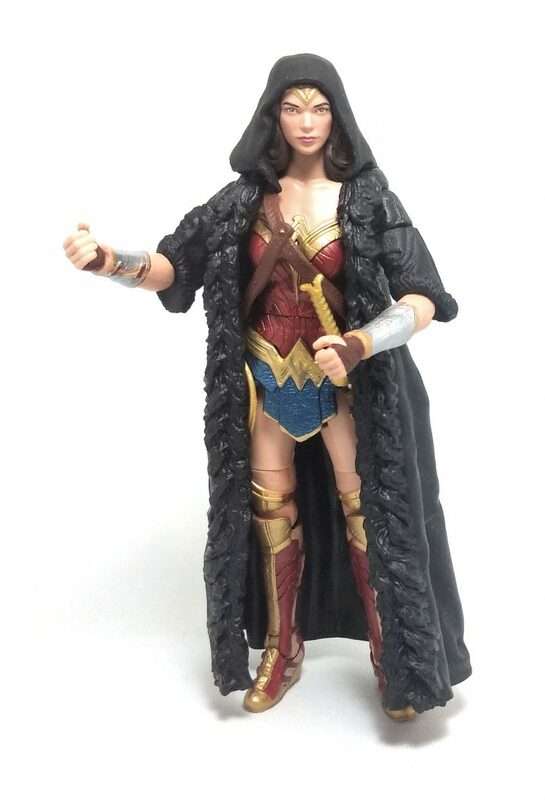 The sculpting on this figure is very good; you get interesting textures on the fur coat both inside and out, the armor and weaponry are nicely detailed and more importantly, the face sculpt is actually quite pretty and it even resembles actress Gal Gadot more than a little bit. Sadly, the character design does impose some hefty limitations to the number of poses Wonder Woman can achieve. The long cloak piece is somewhat of a hindrance, sure, but most of the limitations stem from the joints not being designed to go beyond a certain point. The paintjob on this version of Wonder Woman is generally good all around. There can be small paint scrapes or splotches here and there, but nothing as serious as to prevent ordering these figures online. Of particular note, the paint operations on the face are particularly satisfying, as they showcase Mattel factory’s expertise at producing pretty dolls of various sizes. 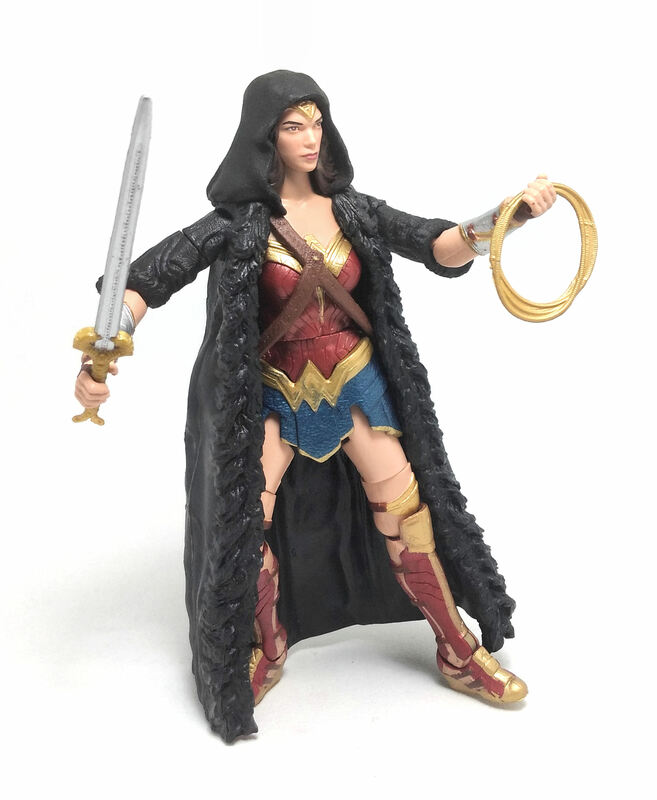 Diana comes armed with a soft rubber lasso rolled up and a sword. Both accessories are very detailed and were molded in gold-colored plastic with only the sword blade painted bright silver. In addition to these accessories, Diana comes with a couple of limbs needed to assemble Ares. 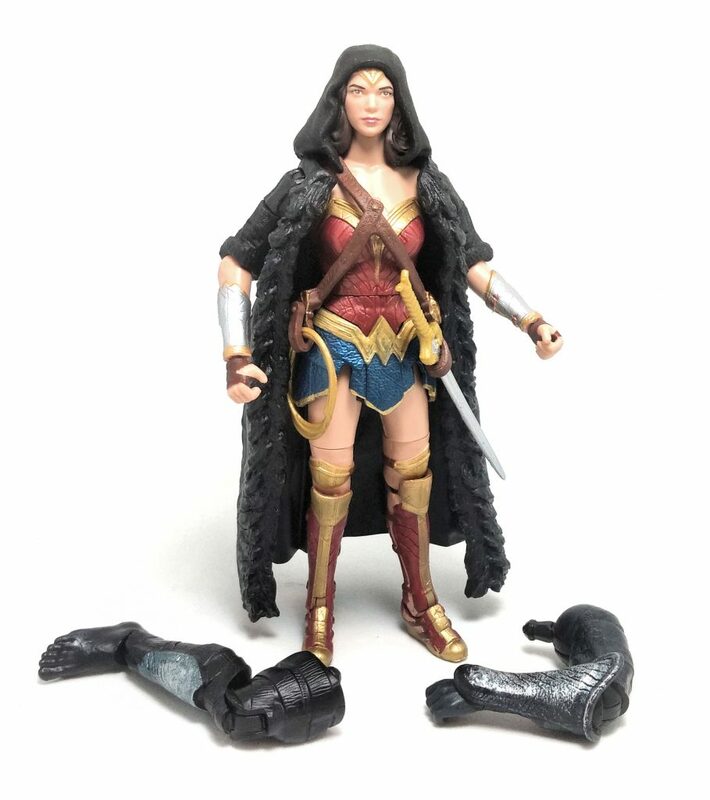 It is important to note that even though the back of the box indicates that this version of Wonder Woman should come with the left arm and the left leg of Ares, the pieces included are in fact the left arm and the right leg. Not to worry, the other character that has the rest of the limbs does have the ones needed to build Ares correctly.